Vocal bought a bank branch in a banking desert to ensure residents retained financial services. Vocal's CEO believes its consumer-focused model will succeed where the bank's large-dollar lending model did not. When Eddie Black, the CEO of Vocal Credit Union ($31.2M, Helena, MT), attended a hearing at the Montana State Legislature in March 2017, he probably thought his testimony against a pending piece of legislation would be the most important thing he did that day. Citizens of a small town located in the southwestern sector of the state might disagree. It was during this trip that Black struck up a conversation with Ben Ruddy, the CEO of Dutton State Bank. And Ruddy had a problem. Ruddy was on the verge of closing the branch that served the small city — whose population wasn’t quite 1,000 as of the 2010 census — in a banking desert. “His two concerns were making sure his staff landed on their feet and the community continued to receive financial services,” Black says. Soon after this conversation, Ruddy sent Black the financials for the White Sulphur Springs branch, and the credit union dug in. Ultimately, Vocal agreed to acquire the branch. Dutton State Bank and Vocal Credit Union run two distinct operational models. According to Black, Dutton is a traditional bank and makes large-dollar and agricultural loans. In contrast, Vocal is more consumer-focused. As part of its business model, Vocal offers a People Helping People payday loan alternative, a loan of up to $75,000 for mobile and manufactured homes, a new or used RV loan, and even a personal loan for purchasing hunting equipment. Because of this model, Black was confident Vocal could serve the community that Dutton could not. The two institutions signed an agreement in May. The state approved the acquisition in June. And on October 2, the credit union began its operation in White Sulphur Springs. “It happened fast,” Black says. To serve the new community, Vocal had to add Meagher County to its field of membership. Another credit union already counted that county in its FOM, but it was headquartered more than 100 miles from White Sulphur Springs, did not have a branch in this area, and supported Vocal’s move into the county. The White Sulphur Springs branch is located more than 70 miles from Vocal’s head office. It holds 900 accounts worth approximately $7 million in deposits and $3.5 million in loans. When Vocal ran the numbers, the deal proved challenging financially. 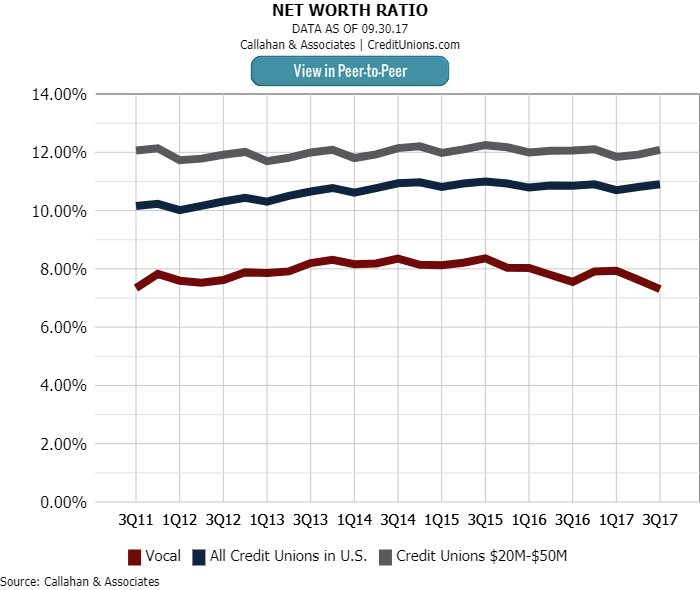 As of third quarter 2017, Vocal’s net worth ratio of 7.46% was lower than the 12.06% average for credit unions $20 million to $50 million in assets, according to data from Callahan & Associates. This didn’t go unnoticed by the regulators when they considered the proposal. Nearly 40% of Vocal’s loans are new or used auto, while other unsecured loans total not quite $690,000. 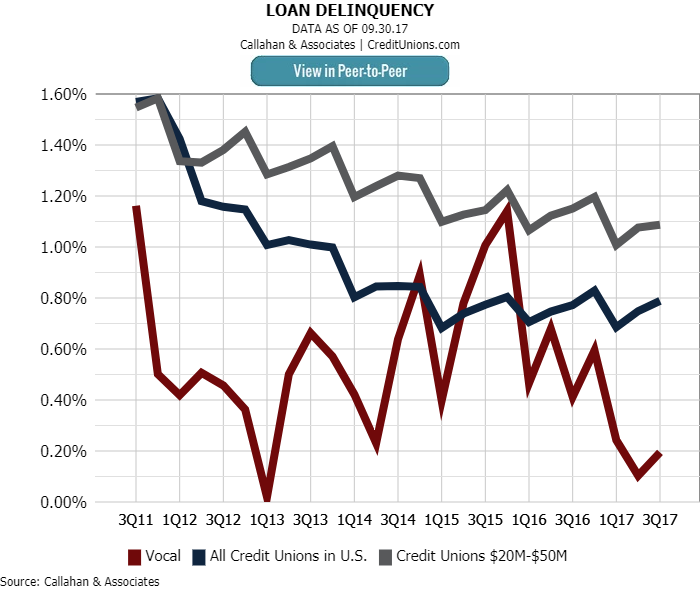 At third quarter, Vocal’s total delinquency of 0.19% sits 90 basis points lower than the average for credit unions $20-$50M in assets, and 60 basis points lower than the average for all credit unions in the U.S.
For the last six years, Vocal’s net worth ratio has hovered between 8.30% and 7.30% — below asset- and peer-based averages. Vocal agreed to take on the $3.5 million in loans but limited its branch deposits to just $5 million of the $7 million. 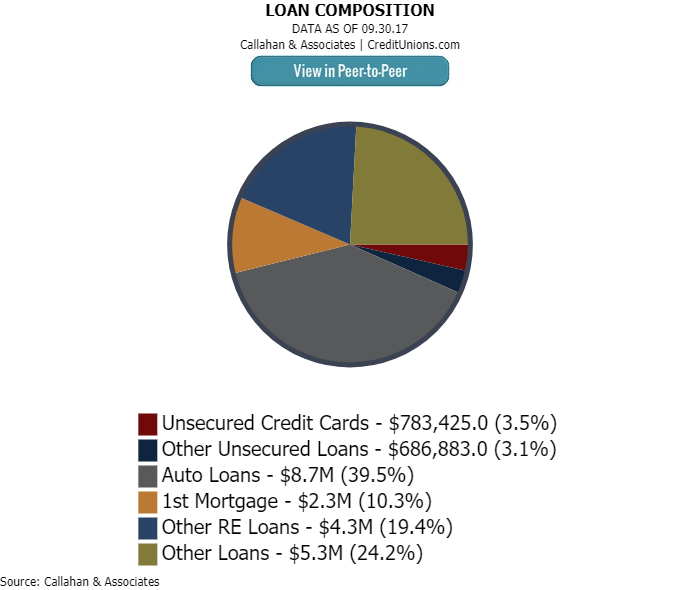 Any more, and the credit union’s net worth would dip below 7%. What Vocal couldn’t take, Dutton kept. And as part of the agreement, Vocal paid par value for the loans and deposits. “We told those new members we wanted their business, we just couldn’t take on all the deposits,” Black says. The credit union needed time to “settle into” the community, according to Black, but it eventually wanted the deposits. Part of settling into the community meant learning about its distinct challenges. For example, White Sulphur Springs is a ranching community, and fall is calving season. Ranchers sell cattle and use their influx of cash to make loan payments and deposits. Regulators also forbid Vocal from purchasing the physical branch building until the credit union can prove its model’s profitability. For now, Vocal rents the building from Dutton, but Black is aiming to buy it by 2019. “From a reputational risk standpoint, [the regulator] wanted to make sure I didn’t get stuck closing the branch and owning the building,” Black says. Make sense of branch saturation and demographic data for any market, or find recently closed branches to reduce the cost of brick-and-mortar expansion. With BranchAnalyzer, the ability to make smart decisions about your branching strategy is just a click away. Beyond the financial realities of the acquisition lies the community at the heart of the branch. White Sulphur Springs is a rural community. The Dutton State Bank branch employed four people who all stayed on with Vocal after the acquisition. In June, Black spent four days per week in White Sulphur Springs setting up the credit union’s IT system. In August, Vocal sent credit union staff to train bank staff on the credit union’s organizational philosophy and the credit union difference. By September, White Sulphur Springs’ head teller was learning the credit union’s core system during a monthlong training at Vocal’s headquarters in Helena. It really is the people that the members are doing business with, not the name on the door. As far as indoctrinating the credit union to its new community, Black says he’s had a leg up there, too. In his past, he officiated high school and college basketball for years in communities across the state, including White Sulphur Springs. In a community this size, he says, the whole town shuts down for basketball games. “It’s a ghost town unless you’re at the gym,” he says. He’s a recognizable figure and a respected community volunteer. That goes a long way in developing local relationships and encouraging new members to join. Retaining all of Dutton State Bank’s staff also proved valuable when interacting with community members. Black is often asked about the staff, and he gets to say the staff has not changed. That bit of continuity is important. “It’s the people that the members are doing business with, not the name on the door,” he says. The acquisition is important for Vocal on a strategic level, too. As a credit union pushing $30 million in assets, the credit union must grow to achieve greater operational efficiency and scale, Black says. Over the next five years, he’d like to see the credit union hit $40 million in assets. By acquiring the branch, Vocal brings on some 500 new members, millions in deposits and loans, and expands into a new county. And while that’s significant, Black also highlights his new talent that’s come onboard, including a commercial lender. Adding services will help Vocal differentiate itself in the years to come, especially now that a new bank has moved to town. But in addition to financial services, Vocal wants to bring a little fun to the community as well. super article. should circulate more.